Organizations that successfully build and leverage their knowledge capital will thrive in today's fast-paced global economy. AskMe helps organizations effectively share their knowledge and tackle some fundamental business challenges. Employees struggle to find the right expert or information to answer pressing business questions in a manner that's timely and accessible. Decisions are made with limited or incorrect information. Effort is duplicated across teams and over time (i.e. answering the same question over and over). Cycle time and costs are increCustomer satisfaction (internal and/or external) is negatively impacted. Customer satisfaction (internal and/or external) is negatively impacted. AskMe breaks down barriers and connects employees across organizational and geographic boundaries through communities—groups connected by common interests and goals. AskMe communities help drive employee engagement and keep people connected through innovative collaboration tools. These tools allow them to create content, give and receive feedback, build a shared vision, and be recognized for their work. This ongoing community-based collaboration provides a broader view of organizational activity and ensures that the pool of knowledge capital is constantly expanded and refined. Employee engagement, problem solving, and innovative thinking is blocked by geographic and functional silos. Duplication of effort across teams (i.e. 3 different project teams pursuing the same problem and coming up with 3 different solutions). Shared vision and innovation from cross-functional engagement is limited or non-existent. R&D and production costs and cycle time increases. 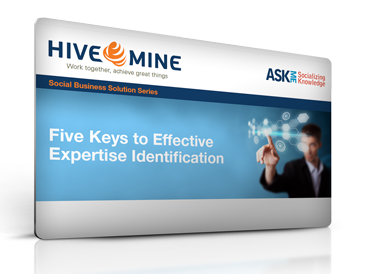 AskMe enables organizations to find the right experts by creating detailed user profiles using tools including smart auto-profiling technology. These profiles are constantly updated based on user activities to continually refine results. Advanced search and analysis capabilities further improve the ability of the system to connect people with questions to the right experts, existing best practices, previous answers to the same or similar questions, and other relevant content in a rapid timeframe. Employees leave the organization and with them go undocumented best practices, critical expertise and unique organizational knowledge that is hard-won over time. Expertise and knowledge must be re-acquired with no guarantee that it will replace what was lost. Productivity decreases, innovation slows and operational efficiencies are reduced. Cycle time and costs are increased. AskMe enables organizations to capture, store and re-use knowledge that is created as a by-product of daily work and collaboration. The knowledge capital that is created by this process includes organizational processes, established workflows, best practices, as well as fact-based content.